This very nice hybrid has two big pluses. First, the flowers are fragrant, an inheritance from its Sinningia tubiflora parent. Second, the plant is very floriferous and easy to grow, distinctly unlike tubiflora, and much more in the heritage of its Sinningia aggregata parent. There is some uncertainty about the precise ancestry of this Peg Conner hybrid. The 1988 Sinningia register of the (then) AGGS says it is (Sinningia aggregata 'Pendulina' x sceptrum) x tubiflora, with first listing in 1987. 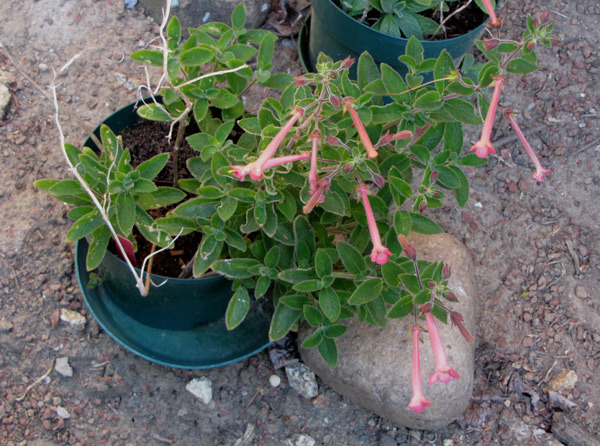 However, on Gesneriphiles, John Boggan pointed out that Sinningia sceptrum was introduced into cultivation only in the late 1980s, and therefore after the hybrid was made. In the early 1980s, Sinningia warmingii was cultivated under the sceptrum name, so the plant in the ancestry of 'Apricot Bouquet' is probably that species. Also on Gesneriphiles, Daniel Steele quoted Volume XI, Issue 1 of Crosswords: "S. 'Apricot Bouquet' is a cross done by Peg Conner of S. aggregata 'Pendulina' x (S. sceptrum x S. tubiflora)". Given the plant, this seems inherently more probable that the attribution in the Register, since the hybrid shows a stronger resemblance to aggregata than tubiflora, particularly in its floriferousness and shrubby habit. Leaves Gray-green, about 3-5 cm long. Dormancy Plant does have a tuber, dormancy appears to be optional. Flower Tubular corolla, about 5 cm long, salmon pink, fragrant. Hardiness Has survived 28 F [-2 C] outdoors, without harm. Recommended? Yes. The hybrid is floriferous and the flowers are fragrant. . Fertility Fertile. Plant has been selfed, and hybrids made with it. Taxonomic group All three parent species are in the core group of the Corytholoma clade, so one would expect it to be fertile, as it has proven to be.